made its much anticipated public market debut on Thursday, jumping more than 70% from its opening price. Twilio’s IPO is the first Silicon Valley VC-backed IPO of the year, and only the second major tech IPO we’ve seen in 2016. 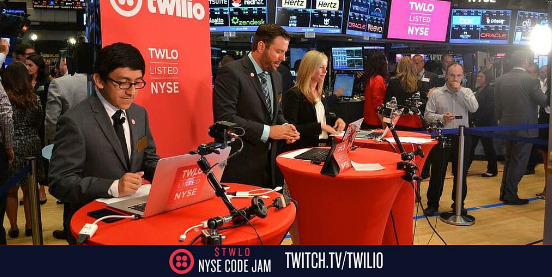 And to celebrate this milestone, Twilio is celebrating in style — with a live coding session on the NYSE trading floor. Twilio’s Senior Developer Evangelist Rob Spectre, Dropbox’s Leah Culver, and longtime Twilio developer David Huerta are currently on the NYSE floor live coding to build apps on top of Twilio’s platform. Their goal is to build “as many apps as they can” build, since no company has ever done this before, Twilio’s representative said. Twilio is the kind of software you’ve probably used without even realising it. For example, the number you use to call or text an Uber driver is powered by Twilio’s technology. The same goes for apps built by Airbnb, Lyft, and Match.com.